Materials: 600 g white (col 0505) "Assouan" (100% cotton, mt = 110 m/50 g) from ANNY BLATT. Patt A: number of sts multiple of 16 +2 edge sts. Work foil chart 1. Only Rs rows are given, on Ws work sts as set, P yo's. right front: start with 1 edge st and sts from arrow, rep patt, end with 1 edge st, at beginning of row K for yo on rows 7 + 19, on rows 1 +13 K 1 for 1st dec.
Work rows 1 - 24 once. Patt B: number of sts multiple of 8 + 1 + 2 edge sts. Only Rs rows are given, on Ws work sts as set or as given, P yo's. Start with 1 edge st, rep patt g, end with st after patt g and 1 edge st.
Rep rows 1 - 50 for patt. Average tension: 21 sts and 29 rows to 10 cm square. Back: cast on 114 sts with 3 mm needles and K 1 return row. Cont with 3 3/4 mm needles in patt A.
Wwm 8 cm = 24 rows cont in patt B, on 1 st row inc 1 st = 115 sts. 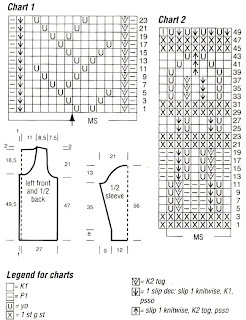 Wwm 47 cm = 136 rows cast off for armholes at each end of every alt row 6 sts once, 3 sts once, 2 sts twice and 1 st 3 times = 83 sts. 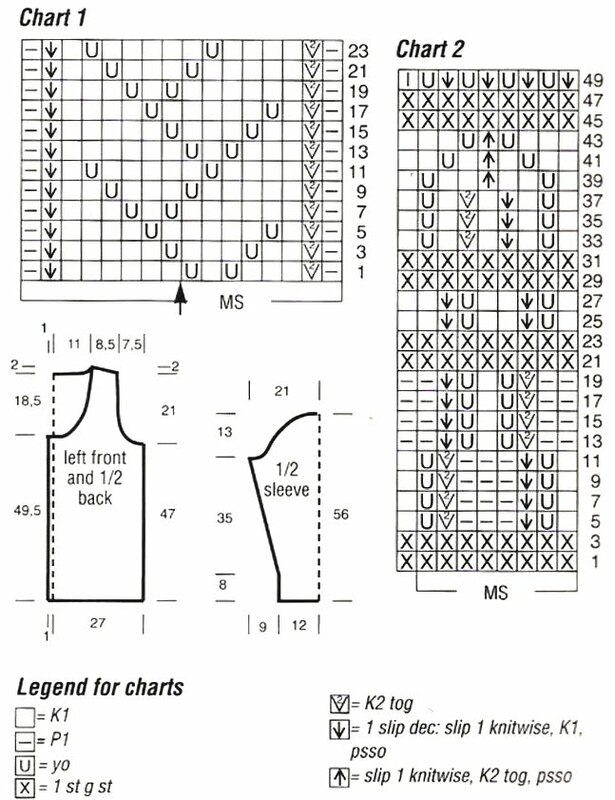 Wwm 68 cm = 198 rows cast off for shoulders 5 sts at each end once, then on every alt row 5 sts once and 4 sts twice. At the same time with 1st shoulder dec cast off for neck the 23 centre sts and finish each side separately. At neck edge cast off 6 sts on every alt row twice. Wwm 70 cm = 204 rows all sts are worked in. Left front: cast on 58 sts with 3 mm needles and K1 return row. Wwm 8 cm = 24 rows cont in patt B, on 1st row inc 1 st = 59 sts. Shape armhole and shoulder at right edge as given for back. Wwm 49.5 cm = 144 rows cast off for neck at left edge on every alt row 9 sts once, 6 sts once, 3 sts once, 2 sts once and 1 st 5 times. Sleeves: cast on 50 sts with 3 mm needles and K 1 return row. Wwm 8 cm = 24 rows cont in patt B, on 1 st row inc 1 st = 51 sts. Starting with patt B inc 1 st on every 6th row 4 times and 1 st alt on every 4th and 6th row 14 times in patt = 87 sts. Wwm 43 cm = 124 rows cast off for sleeve top at each end of every alt row 5 sts once. 4 sts once, 3 sts once, 2 sts twice, 1 st 11 times, 2 sts twice and 3 sts once. Wwm 56 cm = 162 rows cast off rem 19 sts. Along front edges pick up with CN114 sts each and along neck edge 192 sts in continuation, work rows 47 - 50 of patt B and 2 rows g st, in corners of neck inc on every alt row for shaping on either side of corner st 1 st tbl. Then cast off all sts.